This 12-acre National Park Service woodlands site, surrounded by Arlington National Cemetery retains its original historic purpose of providing a park setting for Arlington House, home to George Washington’s grandson and later Robert E. Lee. Development pressure has removed an adjacent 12 acres, and it is hoped that the registry designation will call attention to this remaining forest. 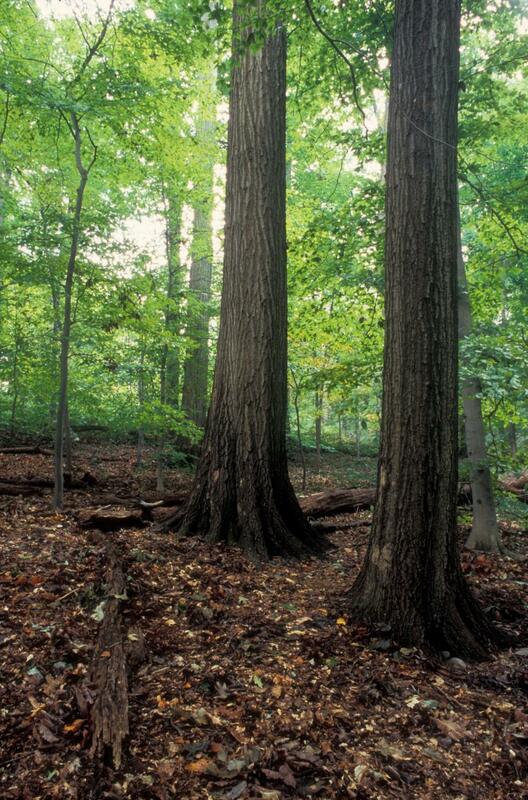 These Washington metropolitan woodlands have never been logged or tilled and contain many very large, old-age trees, some dating to the American Revolution. Most of the area is on a variegated gravel, sand, silt and clay soil and a deep ravine with a perennial spring runs through the forest center. It is one of northern Virginia’s surviving examples of Old-age Terrace Gravel Forest. The ravine forest canopy consists mainly of oaks, hickories, tulip tree and beech with an understory of fringetree, witch-hazel, pinxter azalea, black haw and maple-leaved viburnum, and a carpet of spring wildflowers. Hidden largely from view in a deep ravine and spring-fed stream valley behind Arlington House is the 12-acre Arlington Woods. This rare parcel is the last surviving remnant of an old-age forest that once covered the uplands and hillsides of the 1,100-acre site inherited by George Washington Parke Custis, the adopted grandson of George Washington, in 1802. Fig. 1. View of Washington from Arlington by John Ross Key (1837-1920). Image courtesy The Johnson Collection. “One of the most striking natural features of [this] property was the 600-acre virgin oak forest that nearly surrounded Arlington House.” The 19th century historian Benson Lossing described the picturesque landscape: “Behind the mansion is a dark old forest, with patriarchal trees bearing many centennial honors and covering 600 acres of hill and dale” (NPS). This forest was revered both for its wildness and natural beauty as well as an “imposing backdrop” to the mansion – and was not cut by either Custis or Lee (Hanna 2001). Sloping down to the Potomac River from the front of the house was a vast park-like expanse (Fig. 1) “dotted with groves of oak, chestnut, and [Eastern Red Cedar]” (Hanna 2001). Admiring this view on a visit to Arlington in 1824, Marquis de Lafayette remarked to Mrs. Custis, “Cherish these forest trees around your mansion…recollect how much easier it is to cut a tree than to make one grow” (NPS). Far below the mansion near the shore of the river was the famous Arlington Spring, which “flowed up from a rocky outcropping near an enormous oak tree” (Hanna 2001). Today, Arlington Woods, Arlington House, and surrounding grounds are part of the 27-acre Robert E. Lee Memorial, which is owned and managed by the National Park Service (NPS). The property is situated atop the highest hill of the old Custis estate in Arlington County, Virginia overlooking the nation’s capital. It is surrounded on the north, east, and south by Arlington National Cemetery (ANC) and on the west by Fort Myer – all of which are under the jurisdiction of the Department of the Army. Many fine original trees and groves still frame the rolling landscape of the cemetery grounds, making it the largest single collection of champion and notable trees in Arlington (pers. comm., Greg Zell). A count of radial growth rings of several species of fallen trees in the Arlington Woods section revealed ages upwards of 230 years (NPS). Up until 1995, when jurisdiction of 12 acres was transferred from NPS to the Department of Defense (DOD) for cemetery expansion (Millennium Project), the Arlington Woods parcel was 24 acres: the older-aged, 12-acre section owned by NPS that is closest to the mansion and the valuable but somewhat younger, 12-acre adjacent parcel to the southwest. Alerted in the early 2000s by The Washington Post reporting of DOD plans to clear old-growth trees in what was later to be known as Arlington Woods, locals with the Virginia Native Plant Society (VNPS) and D.C. Chapter of the Maryland Native Plant Society visited the site and assisted with natural resource assessments. A round-table partnership of sorts arose between NPS Site Manager Kendell Thompson and colleagues, Talmadge Williams with the Arlington Black Heritage Museum and Arlington branch of the NAACP, local history societies, and Rod Simmons representing VNPS. The consensus that natural history values of the remnant old-age forest be emphasized above Colonial, African American, Civil War, and even American Indian cultural and land-use histories of the site is reflected in the Arlington Woods Historical Marker erected by NPS. The 12-acre NPS parcel was also designated at this time as a VNPS Registry Site, commemorating the property for its rarity as a documented, old-growth forest remnant in close proximity to the nation’s capital. Fig. 2. 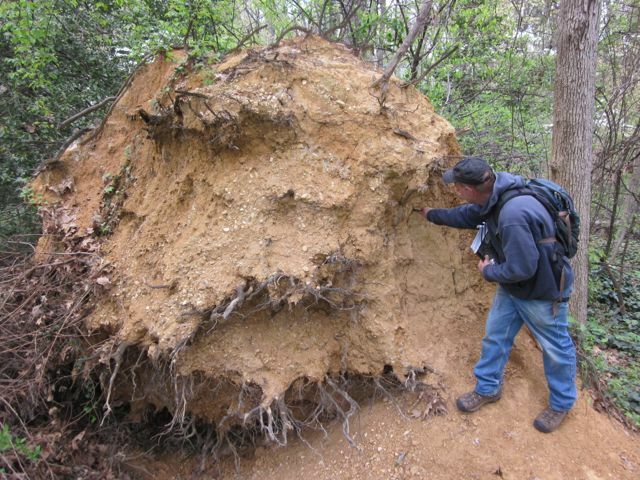 Geologist Tony Fleming examining Potomac Formation soils exposed at the base of a tree blow down at Monticello Park, City of Alexandria, Virginia. Photo by R.H. Simmons. The vegetation, geology, and topography of Arlington Woods are typical of lands situated just east of the fall line (zone) at the western edge of the coastal zone near Washington, DC. This region is historically known for its great floristic diversity, including its many disjunct species, and a variety of geologic conditions. Much of Arlington Woods is represented by two distinct forest community types, as well as small sections of a related third type. As part of the U.S. National Vegetation Classification – National Capital Region project to broaden our understanding of local vegetation types, quantitative compositional and environmental data were collected at three 400 m² forested plots at Arlington Woods: two by Rod Simmons in 2004 and one by Rod Simmons and VANHP ecologist Kristin Taverna in 2005. Fig. 3. Central Appalachian / Inner Piedmont Low-Elevation Chestnut Oak Forest at Rock Creek Park, Washington, D.C. Photo by Steve Young. Running along the southwest-facing upper slopes of the ravine and occupying ancient colluvial slope benches of weathered Potomac Formation clay are narrow remnants of Piedmont Acidic Oak – Hickory Forest: Quercus alba – Quercus rubra – Carya alba / Cornus florida / Vaccinium stamineum / Desmodium nudiflorum Forest (USNVC: CEGL008475). This upland type was much more widespread throughout the old Custis estate in the past, but has largely been cleared over the years for gravesites. Fig. 4. 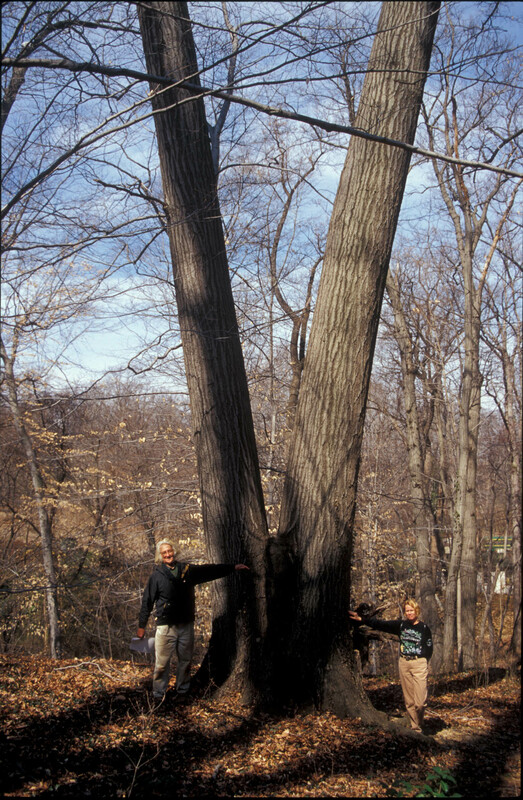 Lou Aronica and Marianne Mooney in the early 2000s with old-age Northern Red Oak (Quercus rubra) growing on the south bank of the cold spring that separates NPS lands from the Millennium Project site at Arlington Woods. At the time, the tree was estimated to be 140 years of age. Photo by R.H. Simmons. Typical examples of this community are often much ore species rich than oak-Heath Forest, while a diversity of upland oaks and hickories (Carya spp.) in the canopy, a fairly diverse understory, and a host of woodland sedges, grasses, and wildflowers in the herb layer (forest floor). It typically occurs as a gradient between Oak-Heath Forest and Mesic Mixed Hardwood Forest, usually on dry to mesic, acidic, southwest facing slopes with high solar exposure (Simmons 2013). Fig. 5. Old-age Northern Coastal Plain / Piedmont Mesic Mixed Hardwood Forest at Arlington Woods. Photo by R.H. Simmons. White Oak (Quercus alba), Northern Red Oak (Quercus rubra), Pignut Hickory (Carya glabra), Mockernut Hickory (Carya alba), and Sweet Pignut (Carya ovalis) are the dominant canopy and subcanopy species here, with White Oak and hickories reaching great size and age. 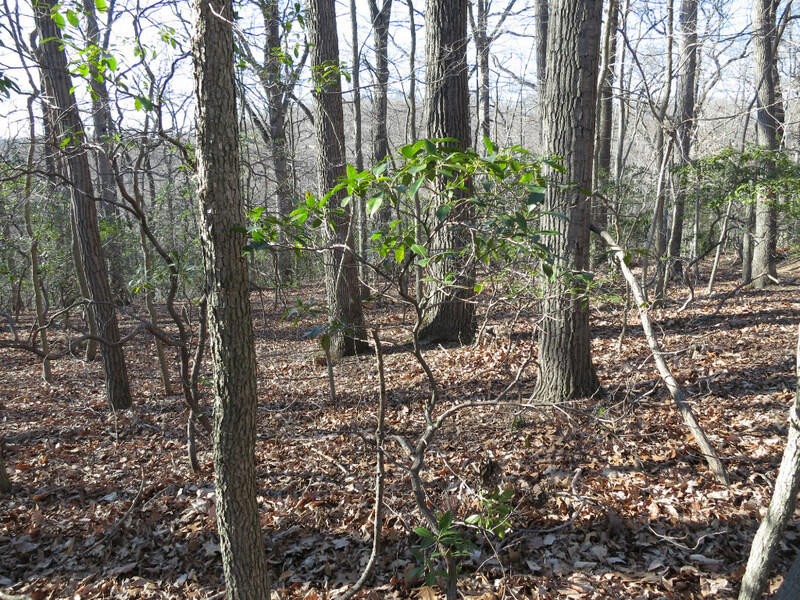 The understory and shrub layers are diverse, with Flowering Dogwood (Cornus florida), Fringe Tree (Chionanthus virginicus), and Pinxterbloom Azalea (Rhododendron periclymenoides) prominent. Much of the vegetation of the lower slopes, colluvial fans, and stream banks throughout the ravine is Northern Coastal Plain / Piedmont Mesic Mixed Hardwood Forest: Fagus grandifolia – Quercus (alba, rubra) – Liriodendron tulipifera / (Ilex opaca var. opaca) / Polystichum acrostichoides Forest (USNVC: CEGL006075). This regionally common forest type occurs on well-drained, relatively infertile, mesic soils and is the classic vegetation type of forested stream banks. Dominant species here include Tulip Tree (Liriodendron tulipifera), American Beech (Fagus grandifolia), White Oak, Northern Red Oak, Chestnut Oak, Maple-leaf Viburnum (Viburnum acerifolium), and Mayapple (Podophyllum peltatum). Many very old and large trees also occur here, especially Northern Red Oak and White Oak (Figs. 4 and 5). The ancient groves and botanical splendor of Arlington Woods have long attracted visitors. Mrs. Calvert, a relative of the Custises, had visited Arlington as a child and remembered the ravine, saying, “It grew deeper and deeper until we seemed lost to the outside world…here we have trees draped with their wild vines, sun flecked shade, ferns, moss, and wild bloom” (NPS). Decades later in 1870, an unknown visitor wrote, “Down in the woods, I found the anemone, the dog-tooth violet, the lady’s-slipper, the fringed polygala, the hepatica…nature was repeating herself with immortal precision and beauty” (Hanna 2001). The earliest and most comprehensive floristic survey of the site was conducted for NPS by Cris Fleming in 1996. While none of the aforementioned plants of the previous century were seen, one hundred and eighty vascular plants were noted, including several uncommon to rare species in the D.C area (Fleming 1996). These plants – Black Cohosh (Actaea racemosa), Spikenard (Aralia racemosa), Sweet-scented Joe-pye-weed (Eutrochium purpureum var. purpureum), Trumpet Honeysuckle (Lonicera sempervirens), Red Mulberry (Morus rubra), Clustered Snakeroot (Sanicula odorata), and Early Meadow-rue (Thalictrum dioicum) – are rare to absent on the coastal plain and are reflective of old-age forest communities near the fall line where the Potomac Formation is deeply dissected and springy, mesic soils are exposed. Similar assemblages of flora occur nearby in identical soils and situations at Glen Carlyn Park and Barcroft Park in Arlington County; Ivy Hill Cemetery and Monticello Park in the City of Alexandria; and various Fort Circle Parks in eastern Washington, D.C.
After little substantive change in Arlington Woods over the centuries, despite years of occupation during a major war and the wholesale conversion of surrounding lands to gravesites, it will be interesting to see what remains of the property in the years following the Arlington National Cemetery Millennium Project. Apart from the irreplaceable loss of mature, native forest and significant fragmentation of the NPS property, perhaps the most egregious aspect of the project will be the utter destruction and replacement of the ancient, V-shaped stream valley and perennial stream that spans the northwest edge of the site. Unfortunately, such vogue stream bank “restoration” practices today – rendered irresistible by lucrative funding and almost guaranteed approval at the public administration level – demonstrate little understanding and appreciation of hydrologic processes, geologic conditions, and our precious natural heritage. Norfolk District of U.S. Army Corps of Engineers. Fleming, A.H. 2006. Arlington House Woods geological inventory. Alexandria Department Recreation, Parks, and Cultural Activities, Alexandria, VA.
Fleming, C. 1996. Report on vascular plant inventory of wooded ravine at Arlington House. Hanna, J.G. 2001. Arlington House, The Robert E. Lee Memorial cultural landscape report. Department of Interior, National Park Service. National Park Service (NPS). Arlington Woodlands Historical Marker. Recreation, Parks, and Cultural Activities, Alexandria, VA.
Weakley, A.S., J.C. Ludwig, and J.F. Townsend. 2012. Flora of Virginia. Bland Crowder, ed. Research Institute of Texas Press.